The product has been derived in part from UKHO (or any other custodian) data. 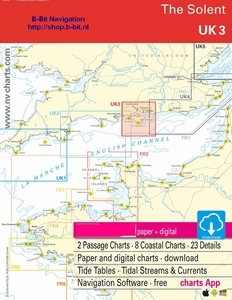 They include numerous harbourplans and details for approaches, passages and anchorages of the given area, extra details for rivers and channels, as well as notes and warnings for the given waters. Visitor berths and moorings are shown highlighted in colour. The clear structure makes finding harbour details or anchorages a matter of seconds. In this way mariners get quick access to all important navigational information. All information is also shown in the nv charts App. Tide- and current data are available in tables and charts in paper. The cartography captivates through ideal scales and wellchosen sheet cuts.